What's On Your Table – Tuesday. Joining in with the lovely Joyce’s What’s On Your Table. 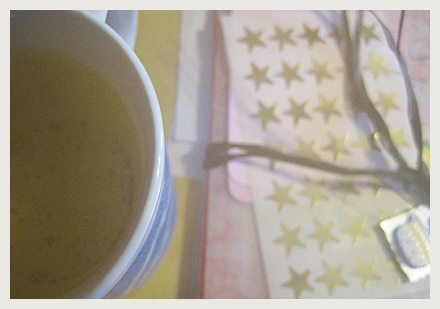 On my table today is a lovely cup of Genmaicha and a bundle of papery things for Pip’s Envelope Project. I’m a bit behind on that one, fortunately I still have time to send something in. Will be making an envelope out of an old magazine page later tonight. I used to make a lot of envelopes and stationary bits when I had pen friends. One of the pieces of paper in the above bundle was made with my own fair hands. I really should get out my mold & deckle and make some more paper. Anyhoo, the photo is a bit blurry because the steam from my tea fogged up the camera lens – tea fog! I wish I had kept my rollerskates. They weren’t pretty, just black and yellow but they were so fun! Forty something Librarian from Sydney, Australia. I have a photography shop at CreativeMarket.